While many people feel justifiably disenchanted with the electoral system, the fact is that democracy can work if we want it to. That’s the thing about democracy. If there are enough people on your side, you win. It’s pretty difficult to deny massive voter turnout if it’s massive enough, so let’s do our best to make that happen. It’s not just a matter of getting people to the polls, but also making sure that our polling places are being properly run. Poll workers are on the front line of the electoral process, making sure that first-time, regular, and provisional voters all have their votes cast. It’s imperative that we have competent, dedicated, and hard-working people in these positions. So, despite the long hours, hard work, and low pay, you’ve decided to get out there and work a polling place. Congratulations. You are awesome. I am going to take you through the process of signing up to become a poll worker and give you an overview of the training and election day procedure. I will emphasize Alameda County because that’s where I work polling places, but I will include links for San Francisco and Contra Costa Counties, as well as try to be more general for the national readers. Remember also, that you can register to VOTE on your county registrar of voter’s website. On election day, there will also be registration cards available to give out to voters who for whatever reason, are not registered when they arrive. Go to the website of your county’s Registrar of Voters. On the website, you will choose which language to proceed in. Language services in Alameda County are a big deal, as well as across California and many other states with a diverse voter base. So if you are multilingual, you are desperately needed. You may even get to take video calls with people at other polling precincts if they need language services. To begin with, you will fill out an application with all of your personal residential information. 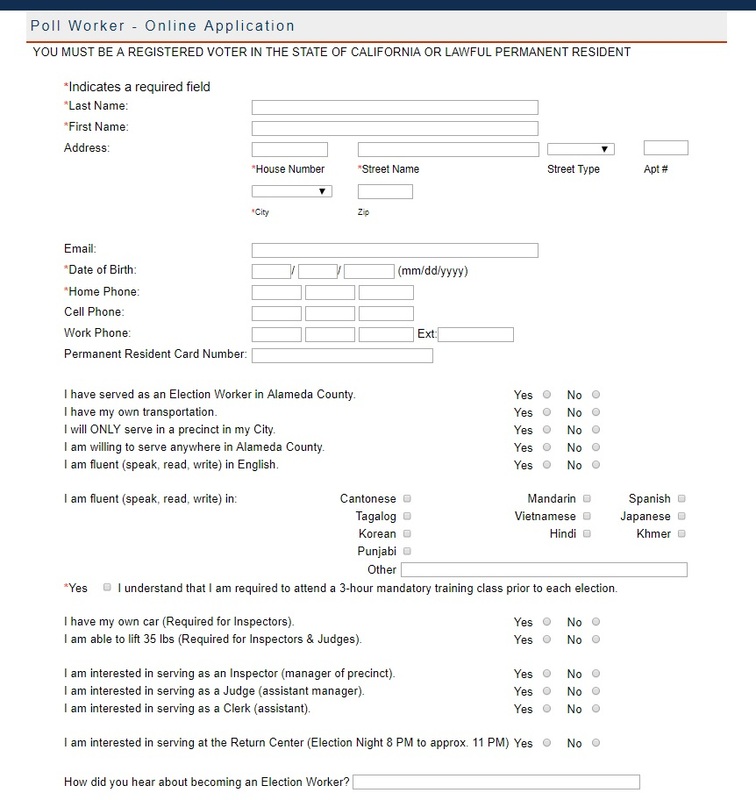 From there you will receive an email with your poll worker ID. You will then be able to navigate to a “survey card” which will enable you to confirm that you will indeed be working a polling place. The email will also include information about your mandatory in-person training, online training, and election day hours. After you sign up via the survey card, you will later on be assigned a polling place and a position. I recommend that you elect to work anywhere in your county, as opposed to your personal polling precinct. Of course, if you are involved in your immediate community and neighborhood, working your precinct would be right in line with that activism. However, it’s not uncommon that others like you are doing the same, and many neighborhoods that don’t have activists in them end up in need of poll workers. So, it’s best if you go where you’re needed. Inspector: This person is basically the manager of the polling place. They must have their own vehicle and be prepared to pick up all of the equipment the night before election day, call all of the poll workers to ensure they intend to show up, and also to designate another poll worker to accompany the Inspector to the drop-off at the end of the night. That’s where you’ll be delivering things like the roster index, ballots, the memory packs of the scanner and touch-screen, and other items. Like many responsibilities at a polling place, this one follows the “two-person rule.” An Inspector will also designate poll worker responsibilities and act as a liaison with the various polling officials who stop by throughout the day. In Alameda County, the Inspector is responsible for setting up and breaking down the touch-screen, which is an accessibility device that allows voters to vote on a touch-screen, as the name implies. It is not uncommon to have first-time poll workers in this position of authority because they have their own vehicles. So if you have a car, be willing to be an Inspector. Judge: This person acts as the assistant manager of the polling place. They assist the Inspector in keeping the polling place organized and on track. They, like the Inspector, will also provide leadership for the clerks working the polling place. In Alameda county, the Judge is responsible for setting up and breaking down the scanner, which is the device into which voters will feed their paper ballots. This is incredibly important as all of the regular voters are counted in this memory pack. Treat the scanner like your baby. Many counties allow for students older than 16 to work a polling place in a support role. They will fulfill many of the responsibilities held by Clerks. If you know high-energy and civic-minded high school students, get them to sign up. It is required for first-time workers to complete online training. This will take a long time. However, Alameda County, as well as other counties, have created a lot of video training examples to demonstrate exactly how to complete each job. You will learn the role of street index officer, who checks in the voter; the roster index officer, who directs the voter to sign in and write their address; a ballot officer that provides ballot cards to the voter and gives them information about their detached receipts; and a demonstration officer, who assists the voter in scanning their ballots or submitting them to the proper bins if they are not a regular voter. The touch-screen for either regular usage or audio (for voters with visual impairments) will have to be activated with a card and you will see video on this in the video training. You will have to complete quizzes at the end of the online training to ensure you have absorbed all of the information. You are not required to complete this training again if you work another election, however I highly recommend you do so because there are often subtle changes in protocols from election to election. This in-person training session will take place in a variety of locations, including City Hall, community centers, etc, much like the locations of actual polling precincts. You will be there for at least three hours, so be prepared for it to be rather grueling. They will give you a copy of The Guide, which has all protocols for election day within it. Keep this. It is incredibly important to have your own copy of the guide because you can mark it up according to your needs. The copy of the guide that you will have on election day cannot be marked on. In addition to a slideshow taking you through the guide, your instructor on training day will have you do hands-on practicals. This means setting up the scanner and the touchscreen, setting up the touchscreen card activation unit and activating cards, and engaging in role-play for the various positions: Street Index Officer, Roster Index Officer, Ballot Officer, and Demonstration Officer. Setting up the touch-screens and scanners will also require paperwork protocol. These forms are incredibly important because they provide the paper trail for each part of the process. At the beginning of the day, you will remove seals and tape them to the forms as you unpack and at the end of the night, you will reseal many elements with pull-tight and adhesive seals. This stuff can be difficult to keep track of, so I recommend that everyone have their own copy of The Guide ready and open to get through it. The two-person rule is useful here because a Clerk can read aloud the instructions and keep track of the form while the Inspector or Judge completes the action. All poll workers must sign seal verification forms. Always keep in mind that you will have to sign things. Don’t assume your Inspector or Judge will remember all of the paperwork, not even payroll. All poll workers should be thinking about the paperwork. Seriously, paperwork, paperwork, paperwork. The process for signing up and going through poll worker training is pretty straightforward and simple. It just requires a lot of time and attention, which is why people are disinclined to do it. Working a polling precinct requires a lot for very little pay. You need to sort of look at it like a volunteer job. With that in mind, I am sure you can imagine what this low-paying, highly-demanding situation draws in terms of participation. People often sign up to work a polling place because they are broke. There is no vetting process beyond the initial online training quizzes. I have worked election days in which members of our precinct struggled with alphabetical order, were there just to chat with voters and get attention, participated in order to feel like an authority and boss voters around, or showed up simply to have something to do. People will also straight-up flake, leaving you without a full staff. Of course, there are also superstars out there who see how important it is and devote themselves to working hard and making the day run smoothly. You can be one of those superstars. So get out there and work a polling place. For poll workers not in Alameda County, navigate to your county’s registrar of voters website and follow their protocols. They will be very similar if you are in California. You can also go to your state government website for information on working a polling place. If you are in states that use suppressive tactics like strict voter ID laws, you will need to play closer attention to those protocols and I highly recommend that once you learn them, you tell everyone. If you have questions about working a polling precinct on election day, you can tweet at me @rangerbagel. I will also be holding my own training sessions for Alameda County poll workers in Berkeley on November 3rd and 4th, the weekend before election day, for practice, Q&A, and troubleshooting. Check out the Facebook event for details.